Chahar will be the second bowler after Siddarth Kaul to make his debut in this UK tour. The Indian team, on their tour of the United Kingdom (UK), has already been impacted by some injury concerns. Previously, Jasprit Bumrah and Washington Sundar were ruled out owing to a thumb and ankle injury respectively. 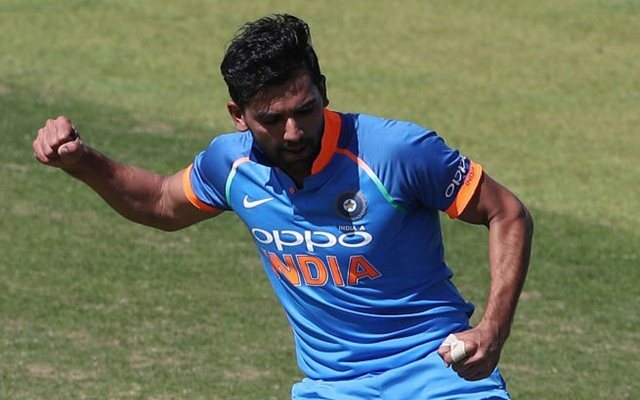 Ahead of the third T20I at the County Ground in Bristol, the Men in Blue have lost Bhuvneshwar Kumar due to a stiff back that is expected to impact their bowling attack. Deepak Chahar, the Rajasthan-fast bowler, has been presented with his maiden international cap. Chahar was previously roped in as Jasprit Bumrah’s replacement. The series is currently level at 1-1 and both teams will strain every muscle to overpower each other. India will also be aiming to win their maiden T20I series on English soil. Chahar has been in decent touch over the past few months. He was drafted in by the Chennai Super Kings in this year’s IPL. He picked up 10 wickets in 12 matches in the tournament and emerged one of their most consistent bowlers. He suffered a hamstring injury midway through the event but came back to wield his magic. He was mostly entrusted to bowl inside the field restrictions. The stupendous performance earned him a spot in the India A team, which played in the tri-series involving the England Lions and Windies A. Shreyas Iyer and his men won the series and Chahar was an integral part of their setup. He was their leading wicket-taker with ten wickets from four matches. Chahar will be the second bowler after Siddarth Kaul to make his debut in this UK tour. The Indian team also made one alteration and replaced Kuldeep Yadav with Kaul. Meanwhile, Twitter is all praises for the fast bowler and they hailed him for making his first appearance. Deepak Chahar’s making his debut, good for him but isn’t it a bit early? Also… why, just because Bhuvi’s not at his best? Great opportunity for Deepak Chahar, was impressive with the new ball in IPL and for Ind A in Eng. So ao happy for #DeepakChahar when in form you should get an opportunity. Deepak Chahar to debut for India today. Handed his maiden cap at the team huddle. Congratulations Deepak Chahar for making his T20I debut for INDIA@ChennaiIPL proud moment.